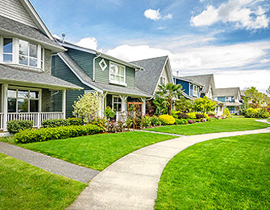 Most people think of their home as the only place to cut energy costs. Energy can be saved in a variety of ways and in different locations. We have ideas on how to cut your energy costs in your landscape as well. The winter often gives homeowners sticker shock when paying for their energy/heating bill. 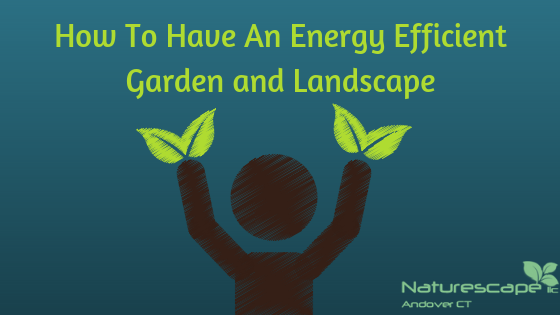 Today we are going to go over how to have an energy efficient garden and landscape. One of the easiest ways on how to have an energy efficient garden is to use responsible watering practices. This can be done in a variety of ways. Use plants that are suitable to the area and don’t require additional watering. Take note of areas that become water logged. Consider installing a rain garden to capture rain keeping it from inundating less tolerant plants. Use drought-resistant plants in areas that are dry or extremely sunny. Consider using rain barrels to collect excess water. Water in the early morning when it is coolest. Check your irrigation equipment for leaks. Fix outdoor leaky water faucets – often a simple washer is all that is needed. Another way to be energy efficient is to use manual tools and equipment if possible. Maintain your equipment regularly so that it runs as efficiently as possible and helps maintain good air quality. To help keep your home energy efficient, plant evergreen trees around your house so that they block the wind. This will keep the hot sun from hitting your home in the summer and the cold winds away in the winter. Choose trees carefully for many reasons. Planting a deciduous tree on the south side of your house will help reduce energy costs by providing shade in the summer and then without leaves in the winter sunlight passes through to allow absorption of that sun we love so much. You’ll also want to use good quality soil which will hold more moisture reducing your need for watering. Solar lights are very energy efficient and most are fairly low cost. Consider them when installing walls, walkways and patios. Consider a grocery delivery service or growing your own garden vegetables which can cut down gas used running to the grocery store. At the very least choose local vegetables that are in season to cut down on trucking that occurs delivering products from far away. This kind of produce is usually fresher anyway. Also, you can use firewood to heat your home. If you take any trees down in the summer or fall, be sure to keep the wood. While these ideas may not generate huge savings every little bit helps! Winter is a great time to plan for landscape additions. Contact us today if you’re looking to make some changes.